Samsung NX30 sensor review: Convincing option? 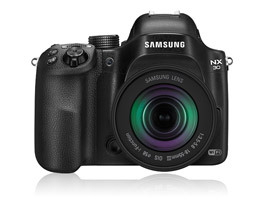 Although it shares the familiar guise of the Samsung NX20 with its built-in EVF this new model features the 20-Mpix CMOS sensor complete with on-chip phase detection AF pixels as found on the current finder-less NX300 model. The body styling is perhaps an acquired taste but in addition to the Hybrid AF system. the NX30 has a number of new and notable features. Although it looks plastic the body is in fact made from an alloy while the EVF is no longer fixed, it’s a pull out and tiltable unit instead. At the rear, the screen has been upgraded to a higher quality panel. It’s a tiltable 3-inch 1.04-M dot resolution Super AMOLED type with high brightness and striking color. Samsung has unsurprisingly promoted wireless communication in cameras and this model has Wi-Fi with NFC capability for sharing and remote operation. Also, as one of their Smart camera models it has some interesting options, including the ability to email photos directly or upload them automatically to social networking sites, PCs or the cloud. As a model intended to appeal to enthusiasts, video has also seen a boost in capability over the NX20s full HD 1080/25/30fps. The NX30 adds a 24fps and slow-motion 50/60 fps options, mic socket with manual audio levels (albeit with no headphone socket) and an uncompressed HDMI output at 1080/25/30fps. Despite the upgraded specification the Samsung NX30 measures a mere 5.0 x 3.8 x 1.6″ / 127.0 x 96.5 x 40.6 mm and weighs 21.9 oz / 621 g. It’s available now at $999 including the Samsung 18-55mm f/3.5-5.6 III OIS (stabilized) zoom lens. 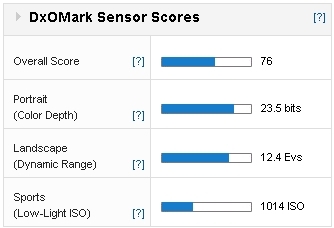 Ranked in 60th place overall and achieving a DxOMark score of 76 points, the 20.3-Mpix CMOS sensor in the Samsung NX30 is a good all-round performer. 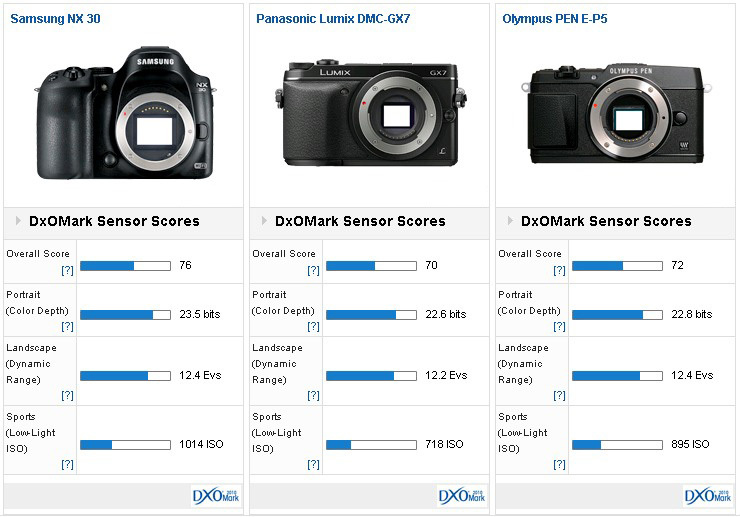 All the same it’s still behind the best 24-Mpix APS-C sensors in cameras like the Sony A6000 ranked 24th with a DxOMark Score of 82 points and the Nikon D5300 ranked in 20th place overall with 83 points. At $999, albeit complete with a stabilized 18-55mm kit lens the NX30 has to compete against some tough rivals. We’ve looked at two very capable Micro Four Thirds models but the NX30 has to contend with others using APS-C size sensors including the new Sony A6000 and the Fujifilm X-T1. Against the 16-Mpix Panasonic Lumix GX7 and E-P5 from Olympus the NX30 fares well but despite the 4-point lead that really only equates to a +1/3 stop improvement in sensor performance overall. Samsung’s NX30 offers is a well-rounded camera with a pretty decent level of capability both in the extended feature set and sensor performance. Despite the larger sensor however, there’s really only a small improvement in performance over the best of the current Micro Four Thirds models, yet it’s overshadowed somewhat by more affordable rivals from Sony.